At glance, we easily find the position of Halong Bay on Halong bay map. Surrounded by other islands or bays in Nothern Guft, Halong Bay seems a small one but the most famous bay for its breathtaking natural scenery, attracting thousands of tourists all over the world. Make a closer look on Halong Bay map, you can see exactly what coordinates Halong to be located in (106°58′-107°22′ East and 20°45′-20°50′ North). 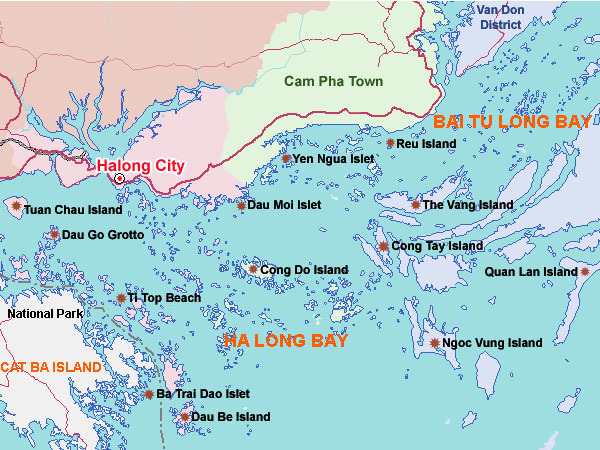 Particularly, Halong Bay is limited to the northeast of Bai Tu Long Bay, to the southwestern of Cat Ba Island, to the west and northwest of the mainland coastline. 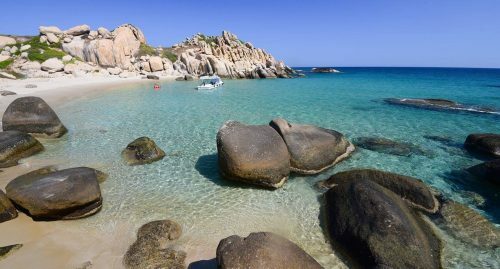 This Bay is dominated by more than 1,600 limestone karsts and islets which rise out of the waters of the bay to heights of up to 100 meters (330 feet) and the numerous caves and grottos spread throughout the bay. Thanks to Halong Bay map, travelers only need to visit some worth – visiting places which are listed clearly as attracting destination of Halong Bay such as Tuan Chau Island, Dau Go Grotto, Sung Sot Grotto, Ti Top Beach, etc. In case of lost way, travelers just need follow the direction of this map to come to expected sites. 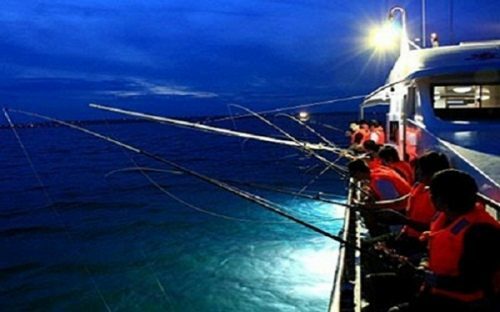 Setting foot to this land, visitors extremely impress about Halong’s unique beauty not only as a giant conservation zone of nature, especially variety of tropical ecosystem with rarest species in the world but also Halong people who are so friendly and hospitable that tourists hardly say goodbye. With a Halong Bay map in hand, travelers will never feel worried about where to go and what to see. The last thing remaining are wonderful feelings and unforgettable memories about Halong Bay, one of Mother Earth’s most amazing natural wonders and one of Vietnam’s most prized treasures.